Get a taste of the outdoor life with our selection of easy to cook barbecue recipes. We cook them twice so you can be sure of perfect results each time. Click on any picture in the barbecue recipes below for full cooking instructions. 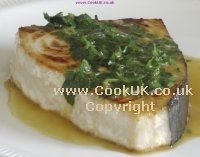 One of the very few fish which can be barbecued as easily as meat. The chunky flesh of a swordfish takes on all those barbecue flavours so easily. These are a Normandy version of skewered and barbecued pork. Marinate the pork in cider, sage and crushed peppercorns. Alternate the skewer with the marinated pork and sweet apples then barbecue for 10 to 15 minutes. Simple and delicious. Popular around the world , there are hundreds of variations of this recipe. Our version definitely has a Greek flavour to it. Good for the barbecue or the grill. We also show you how to make a simple Greek yoghurt. Cumin. paprika and coriander impart lots of flavour to the marinade for these kebabs. The leeks can be replaced by tomatoes if you want. Easily cooked in eight minutes these make a great reliable barbecue meal. Chicken is ideal for the barbecue because it cooks quickly. These kebab spirals are spectacular with white chicken flesh spiralled around bacon and tomato paste. They taste superb and look incredible. Slightly more complicated compared to normal kebabs they are well worth the effort. 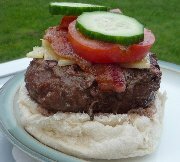 Our cheeseburger recipe is easy to follow and shows you exactly how to make the perfect cheeseburger. A succulent burger topped with a cheese of your choice and crispy bacon. The perfect barbecue meal. 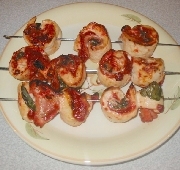 Shashliks are a variation on the common kebab recipes. 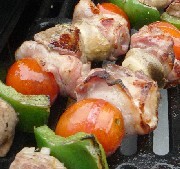 Delicious lamb with lots of tomatoes, mushrooms, sweet peppers and streaky bacon make this an excellent barbecue recipe. 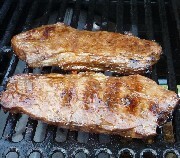 One of our top steak recipes for the barbecue. Not only do the mandarin oranges tenderise the steak, we also show you how to salt the steak for extra tenderness. Highly recommended.